"Lucianovic proves that hanging out with a picky eater doesn't have to be torture--do not judge the picky eater, just laugh as she learns to enjoy cruciferous vegetables." Beth Lisick, author of Helping Me Help Myself and cocreator of Porchlight, the San Francisco storytelling series. 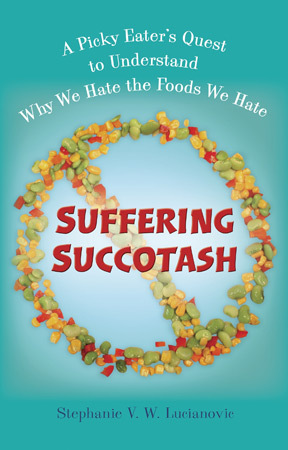 Suffering Succotash is referenced in O, The Oprah Magazine's book club issue, July 2012. "The Science Behind the Foods We Love (and the Ones We Hate!)" "Lucianovic tells an entertaining story of her life in pickiness...If pickiness makes you miserable, this might be just the cure." --Marion Nestle, Food Politics, December 14, 2012. Live interview with Morning Living, Martha Stewart Radio, July 2, 2012. Interviewed by Steve Fast for "The Steve Fast Show," WJBC-AM, Chicago. Live interview with "Chuck & Don," KMA (ABC Radio affiliate), Cedar Rapids, Iowa, July 10, 2012. Live interview with Bulldog for "Rude Awakening," WOCM-FM, Baltimore, July 10, 2012. Interviewed by Corey Dylan for "Your Story with Corey," WFAL, Tampa. Interviewed by Jim Donovan for "Central New York Saturday Morning News," WSYR, Syracuse, NY. Live interview with Tron Simpson for "Tron in the Mornings," KCMN-AM, Colorado Springs, July 10, 2012. Interviewed by Dr. Alvin Jones for "The Business of Wisdom," WNEW-AM (Washington, DC) and WCBQ-AM/WHNC-AM (Raleigh/Durham, NC). Live interview with Rochelle & Pam for "Chat with Women," KKNW-AM, Bellevue, Wash., July 10, 2012.